5 Reasons You Shouldn’t Get a Target REDcard! Yesterday, I wrote about the Target REDcard and five great reasons to get a Target REDcard. To be fair, though, I must admit that a Target REDcard isn’t for everyone. Check your wallet right now. How may credit cards do you have? Now ask yourself if you really need or want another credit card. Signing up for a Target REDcard does have several advantages, but if you opt for the REDcard credit card, it could add to your already growing debt. Of course, you can also opt to get a Target debit card and avoid this, but even that has its drawbacks. It’s so easy to hip out that handy dandy Target REDcard debit card to pay for your purchases! What isn’t easy for some people is keeping track of those purchases. If you have a low balance in your bank account or you don’t regularly balance your checkbook, a Target debit REDcard could put you in the red. Some purchases, particularly online purchases aren’t deducted from your account immediately, and you could possibly forget about them. When this happens your account could be overdrawn if you make another purchase or pay a bill and there isn’t enough money in your account to cover your REDcard purchase. No fun! As mentioned above, adding another credit card to your wallet could add to mounting debt. Carrying a balance on your Target REDcard will not only cost you in interest, but it could trash your credit if you’re unable to pay your bill in the future. If you’re already having trouble keeping up with your current credit card payments, getting a Target REDcard credit card isn’t the best idea. Not surprisingly, the Target REDcard can only be used at Target. From a business part of view, this is brilliant, since it keeps customers returning to your store. From a customer’s point of view, though, it may or may not be such a good thing. 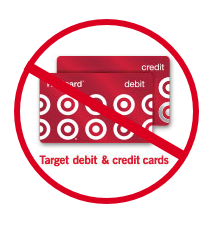 Regular Target shoppers can enjoy the 5% discount and convenience that comes with the Target REDcard, but sporadic Target shoppers just end up with another card to worry about. If you’re a regular Target shopper, it may seem to make sense to sign up for a Target REDcard. However, if you think you already send too much at Target, a REDcard won’t help that situation. In fact, you’ll probably end up spending more with your REDcard. The big red retail giant recently stated that REDcard holders increase their spending at the store by more than 50 percent, on average, after they sign up. This could be attributed to loyalty and discounts, but it probably also has a little something to do with the simple fact that shoppers generally spend more when paying with cards than when paying with cash. What are some other reasons NOT to get a Target REDcard?